Purpose- built room with full disability facilities, built to AS1428. King-size bed, full size fridge, tea/coffee making facilities, toaster, microwave and hair-dryer. Single bed can be included if required. Outside seating. These rooms cater for up to two adults and two children, with a queen bed, double bunks, table and chairs and a two-door refrigerator. With a very comfortable queen and single bed, each room can cater for up to three people. 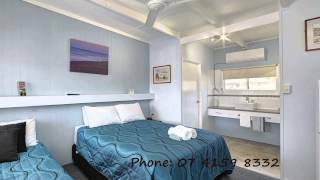 All rooms have reverse cycle airconditioning, ceiling fans and limited cooking facilities with toaster, kettle, two door fridge/freezer and microwave, 32 inch televisions and DVD player (on request). The most comfortable queen bed, with separate shower and toilet, tea/coffee making facilities, full size fridge, toaster, microwave and hair-dryer.